Do you really need to own a boning knife? If you’re serious about cooking, then your answer to this question is yes. It might not seem an obvious choice when you’re updating the kitchen, but this essential piece of kit will revolutionize your cooking experience. Slimmer and more agile than other blades, a boning knife offers you more control when preparing a piece of meat. This tool allows you to break down a chicken quickly and easily, or remove the bones from a joint without destroying your choice cut. To help you find the perfect product, here we’ve compiled a guide to find the best boning knife currently on the market. Before purchasing a boning knife, you need to consider which key features are most important to you. Below is a handy table comparing the crucial elements of a quality piece of kit. It’s there to help you to make the right choice and find the best boning knife for you. Created with Japanese Takefu ‘Super Steel’ and tempered in liquid nitrogen, this boning knife certainly sounds impressive. Measuring just 10.6 inches tip to tip, it possesses one of the shortest total lengths in our list. However, it makes up for its lack of size with superior quality and beautiful craftsmanship. Both stain and rust resistant, this 6-inch blade guarantees endurance, versatility and high performance. The full tang extends seamlessly throughout the triple riveted handle, providing a perfect balance to make sure that any task can be performed safely and with ease. The ergonomic design offers comfort and stability, making this knife a real pleasure to use. The Zelite Infinity’s impressively sharp stainless steel blade helps you to achieve flawless deboning over a wide range of fish and meat products. It also performs remarkably well when preparing the rest of a meal, shaving through fruit and vegetables with minimal resistance. A tapered bolster ensures this knife is both attractive and safe, protecting hands from the razor sharp edge. Finished with a stunning Tsunami Rose Damascus pattern to the blade itself, the Zelite Infinity lives up to the stellar reputation of professional boning knives and is worth every penny. As it does represent an investment, it’s advisable to wash this knife by hand to increase longevity and preserve its flawless appearance. To maintain the quality of the edge, the knife will need resharpening after prolonged use. Despite this, it is a hardwearing tool and will appear good as new with just the minimum care and attention. The name Wusthof carries a certain weight when reading through boning knife reviews, and this flexible classic model lives up to that reputation. If you’re prepared to pay a little more, then this knife could be the one for you. Forged from high carbon steel with a traditional-style composition handle, this knife offers both strength and comfort. Its flexibility works in its favor when used for light or delicate work, such as filleting fish or removing skin. However, it is also capable of gliding through meat and works just as well when deboning a shoulder of lamb. The triple-riveted handle contains the full tang which, in a 6-inch boning knife such as this one, provides the ideal amount of balance and weight in order to optimize the knife’s performance. Hand-honed to a razor-like sharpness, it holds its edge well. This aspect guarantees permanence and longevity from a product where you want the quality to reflect the higher price. Measuring 12.5 inches tip to tip, this is a hardworking tool that cuts close to the bone with little effort on your part. The flexible and narrow blade minimizes waste, allowing you to achieve results close to those of butchers’ boning knives. This knife feels good to use and lives up to its design, but it is on the higher end of the price spectrum. It is worth keeping this detail in mind when considering which boning knife would be the perfect fit for your pocket. 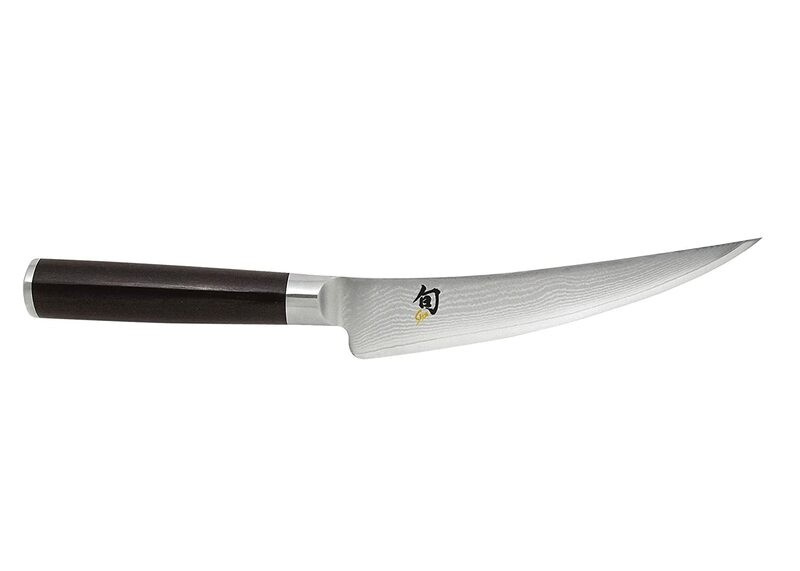 Seamlessly constructed from one piece of Japanese steel, this knife is sleek, lightweight and graceful. The ergonomic handle is molded to offer superior comfort when in use, and the lack of any joins means that it is easy to keep hygienic and sanitary. Manufactured from a molybdenum/vanadium stainless steel, the high-tech nature of the base material ensures the strength of the blade and prevents corrosion over time. With a slightly longer blade length of 6.25 inches, it is still a well-balanced instrument and, due to the slightly smaller handle, is found comfortable by those with smaller hands. As one of Global’s original knives, the Cromova G-21 is suitable for both professional and home use. However, it is not recommended for beginners; the knife slices through meat or fish very quickly and an inexperienced user may find that this inhibits them somewhat. But if your skills are up to scratch, then this knife might be the one to try. Global’s signature pattern of dimples on the handle offers excellent grip despite the smooth steel surface. This ensures that the knife will not become slippy when wet, and makes for an overall easy and safe experience. The double-beveled blade means that it’s ideal for both left-handed and right-handed users. Ground at a more acute angle than the European standard, the blade has excellent edge retainment and longevity. 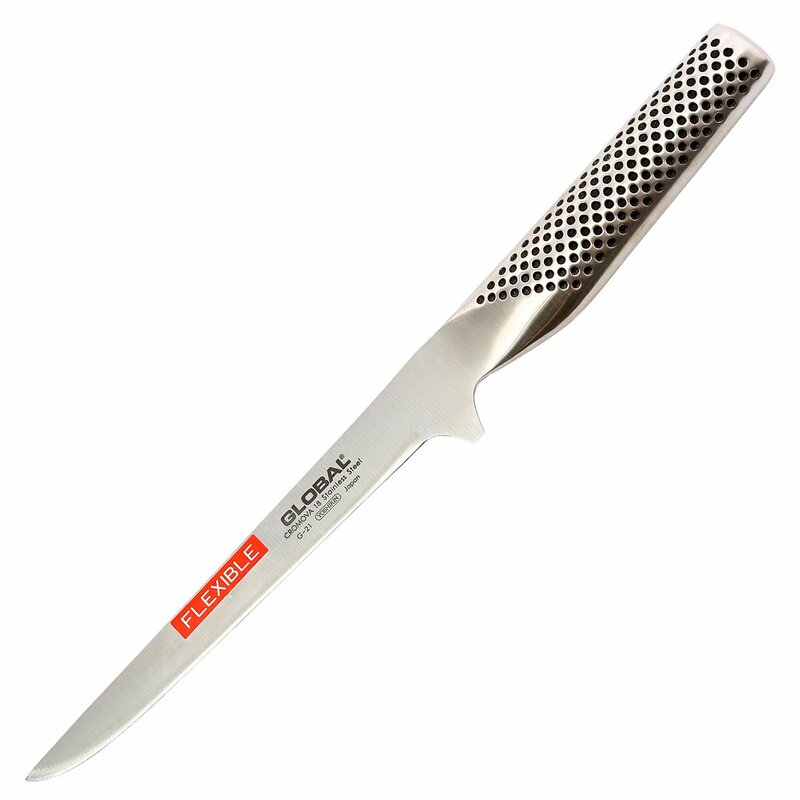 Narrow and flexible, the Cromova G-21 is perfect for delicate deboning work, or filleting fish. Inspired by the craft of ancient Samurai sword-making, this classic knife from Shun is precision forged in Japan. Using Japanese ‘Super Steel’ from renowned manufacturers KAI, Shun has created a beautiful, durable and efficient boning knife. When looking at global boning knives, it is Japanese boning knives that often come out on top, and the DM0743 is no exception. An attractive D-shaped handle made from Pakkawood makes this knife both hardwearing and comfortable to use. The damascus look of the blade not only appears exquisite, but also reduces drag when slicing through meat or vegetables, and is non-stick. During the cladding process, microscopic air pockets are created on the surface of the blade; these will ultimately reduce friction when the knife is in use. The blade is rust-free, maintains first-rate edge retention, and is perfect for precision work. The semi-stiff blade can be less responsive when attempting delicate boning or filleting work, but its curved shape slices effortlessly through larger cuts. If you’re looking for a knife to use on fish or more fragile meat then this may not be the one for you. However, if you want a classic 6-inch boning knife that will cut through meat with precision, the DM0743 is worth investigating. 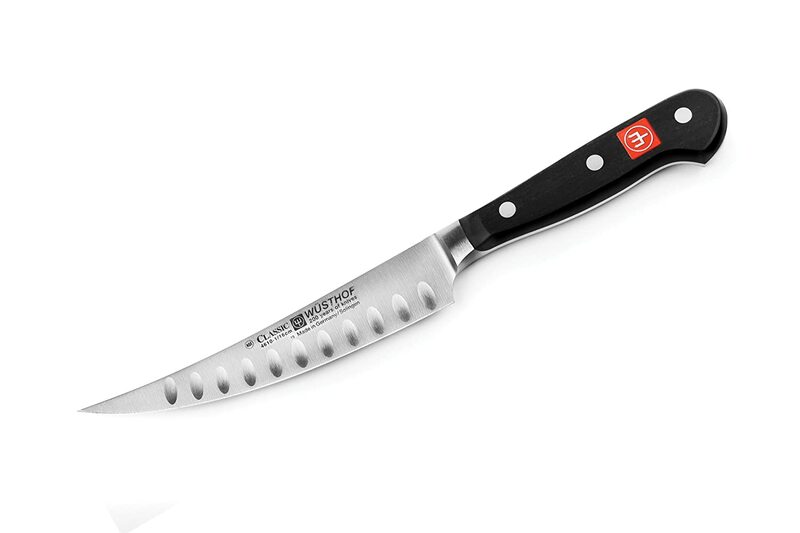 Elegant and eye-catching, this is a great looking knife suitable for both the professional and home cook. 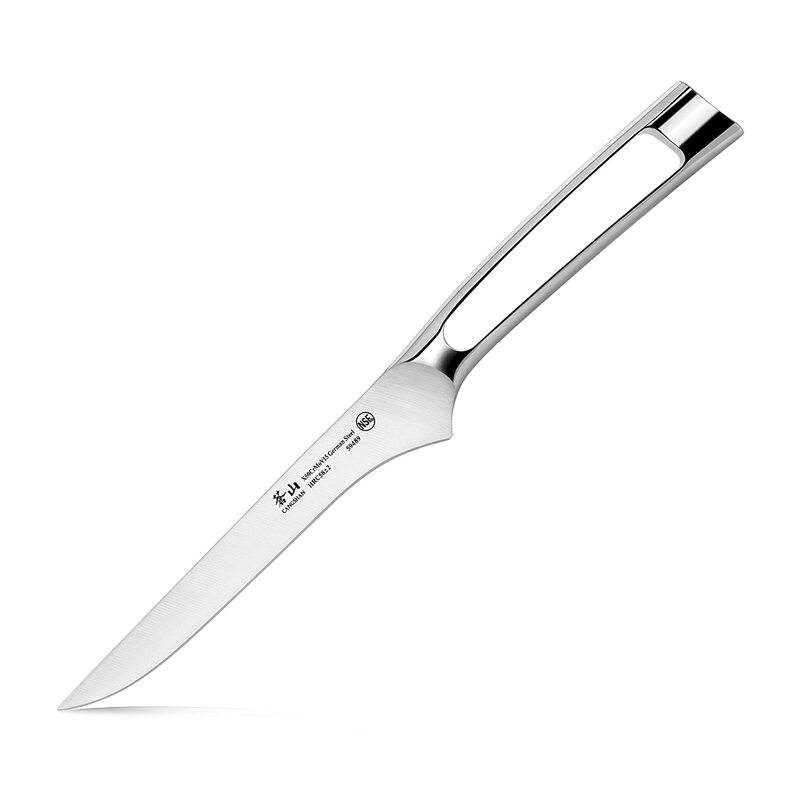 A boning knife from Wusthof comes with a guarantee of quality. The hollow edge on this classic boning knife is an added feature that keeps particles of food from sticking to the carefully honed edge. This ensures better edge retention over the lifetime of the implement and reduces friction when the knife is in use. Crafted from one piece of special alloyed stainless steel, the high carbon content of the material makes for a strong blade and easily maintained sharpness to the edge. The seamless construction makes for a more hygienic tool in your kitchen, ensuring that there are no nooks or crannies in which food particles could get stuck. A Wusthof knife makes food preparation fun and enjoyable, rather than a chore. The curved shape of the blade makes tasks such as filleting fish or deboning meat much quicker and simpler, giving you more time to work on the rest of the meal. Measuring 11 inches from tip to tip, the 6-inch blade ensures a well-balanced knife and the high carbon steel makes this a strong blade suitable for heavy duty deboning work. If you plan on working mainly with larger cuts of meat, rather than more delicate fish or other meats, then this knife presents a good option. Although extraordinarily sharp from straight out of the box, you may find this knife less durable than others listed here. It is worth remembering this when considering purchasing this model, as the price is higher to reflect the prestigious Wusthof name. From the inventors of the Swiss Army knife comes this high carbon stainless steel boning knife. Ice tempered to create a sustainable sharpness, this knife promotes longevity by making resharpening more effective and easier to do. The S-shaped edge offers ultimate precision and control when in use, and the inclusion of a bolsterless edge means that the full blade can be used when deboning. At 16.2 inches from tip to tip, this is a long knife but with a standard blade length of 6 inches. The full tang extends to the end of the handle, offering supreme balance and control with the longer handle offering good maneuverability. An ergonomic POM (plastic over molded) handle won’t crack after prolonged use and ensures that there will be no separation between handle and blade. Using a hot drop forging method in Germany, the steel for the Victorinox knife is heated before being hammered into shape. This heat treatment method of forging creates a high-quality blade with maximum edge retention. Due to the method in which it is crafted, this knife is great quality but is heavier and thicker than other knives reviewed here. This means that it can require more physical effort in order to use for boning or filleting. 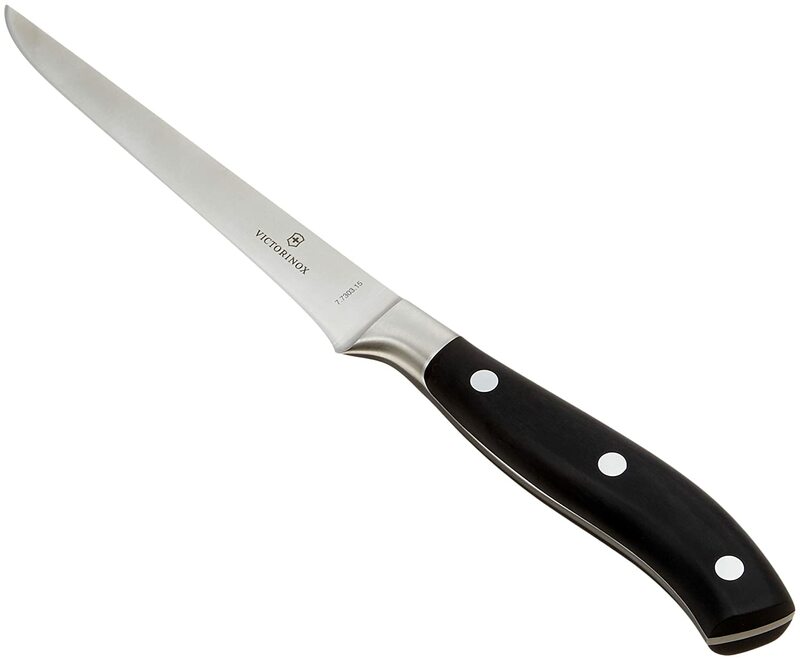 With a straight, semi-stiff blade, the Victorinox is not for very delicate work, but rather is best used for less detailed boning such as with chicken. The Zwilling boning knife from J.A. Henckels has the shortest blade out of those reviewed here, measuring just 5.5 inches. However, the knife is 15 inches in total from tip to tip so, despite the shorter blade, it gives great stability and balance. The full tang extends to the end of the molded polypropylene handle, creating a sturdy yet maneuverable tool. There are no rivets fixing the handle, but rather the polypropylene is bonded permanently to the knife’s blade. This improves the balance of the knife, creating greater stability. The Zwilling is designed specifically for everyday use and, as such, it is great value for money. 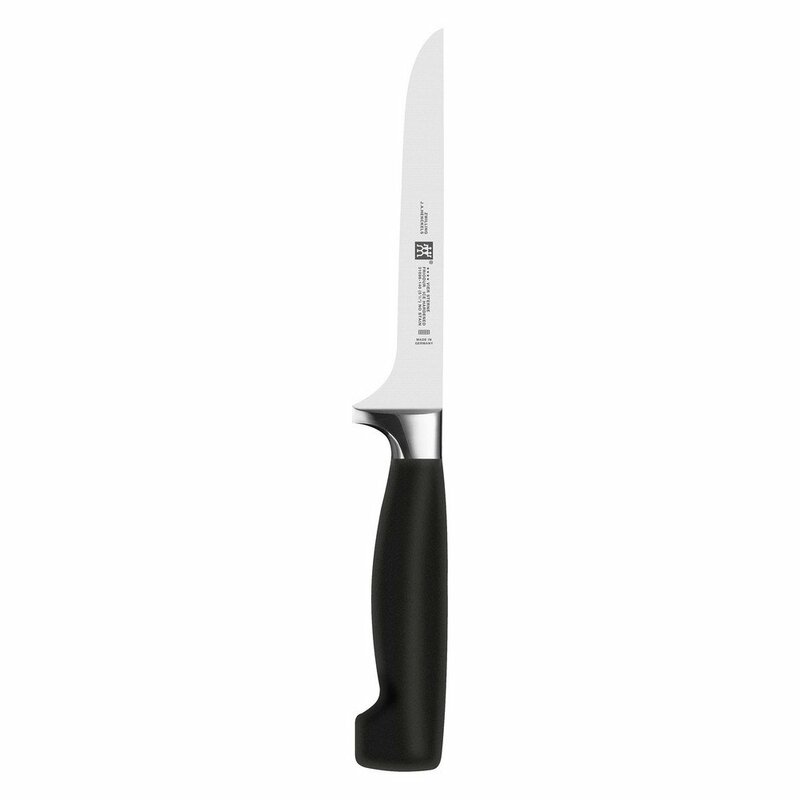 It’s a slim design, with the narrow and flexible nature of it making deboning easy. We recommend this as the best boning knife for deer, due to its flexibility and design. The laser controlled edge assures a more consistent blade angle and makes the blade sharper. It is a knife that is highly resistant to erosion and therefore maintains its sharpness for longer. This makes it an easy knife to just pick up and use. 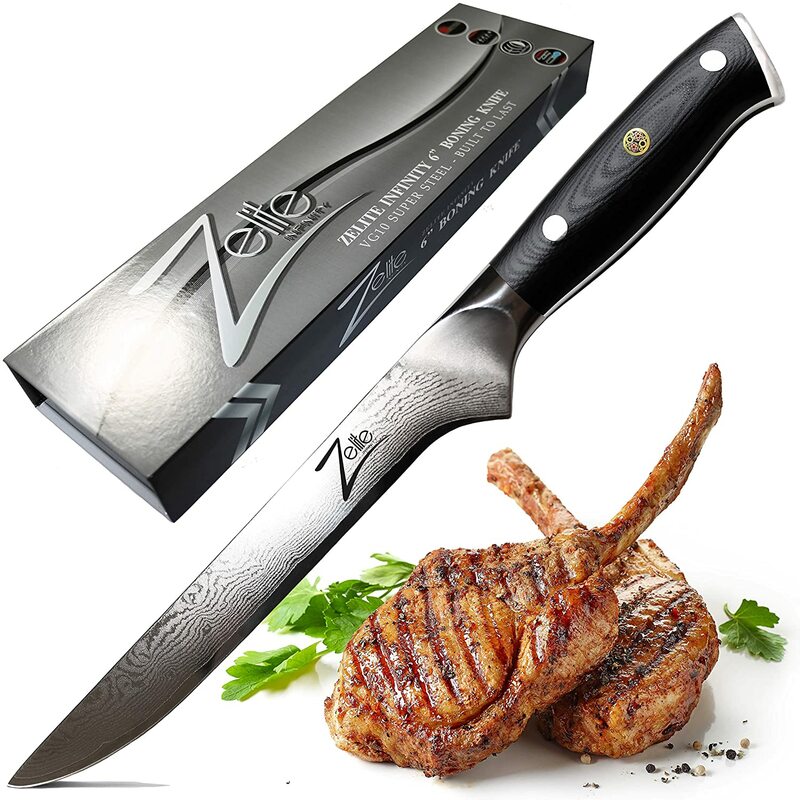 Made from hardened high carbon stainless steel, it is precision forged in German steel. This is a blade to treat with respect. It may need whetting more frequently than other knives, and does require some frequent upkeep in order to preserve its condition. The Zwilling boning knife is ice hardened and so resharpening should be fairly straightforward, but you may find that it needs attending to more often than others. This knife from the Cangshan N1 series is forged from superior German steel, making it very hard but flexible. This combination ensures that the blade can deliver both accuracy and stability when in use, and increases the knife’s longevity. It has a unique all-metal design, and the one-piece construction proves hardwearing and durable. This knife reacts well to heavy use, making it the perfect everyday boning knife for the home kitchen. Although it is great quality, it is cheaper than the others listed here and so could be best for an inexperienced or casual home cook. Whilst it represents great value at the lower end of the price spectrum, you may find that food becomes stuck in the grooves found on the handle. You may also find that the tang has an edge to it, and requires rounding off at home in order to make the knife comfortable to use. This is the downside to saving on price, but neither aspect affects the adequacy of the knife for deboning tasks. The elite materials that make up this hand sharpened knife make for incredible sharpness and a well-balanced tool. An ergonomic handle with unusual ‘cut out’ design makes the Cangshan N1 series both visually appealing and comfortable to use. If you are looking to save a little on cost, but not on quality, then this could be the ideal boning knife for you. There are a plethora of great boning knives currently out there on the market, but in this comparison activity, it’s clear that one, in particular, comes out on top. Although this list contains a number of great quality, good value boning knives, the Zelite Infinity 6-inch boning knife ticks all the boxes. When purchasing a decent boning knife, you want a well-balanced tool with a sharp blade, versatile design and hardwearing material. A beautiful looking knife that you can proudly display in your kitchen is an added bonus. Crafted from Japanese ‘Super Steel’, tempered in liquid nitrogen and sporting a stunning Damascus pattern on the blade, the Zelite Infinity knife hits each of these requirements perfectly and manages to steal the show. When purchasing a boning knife, there are several crucial aspects to consider. This guide highlights the ones to look out for, in order to make your shopping experience quicker, easier and more successful. What is the blade made from? Arguably the most important part of knife, you need to consider the quality of material that you will actually be using. Stainless steel is a must, to prevent rust build up or dulling of the edge, and a well-tempered blade will offer a more hardwearing, durable finish. It is a good idea to think about which tasks you will mostly be using the knife for. Eat a lot of fish? Perhaps you’d be better off with a narrower, more flexible blade for the more delicate task of filleting fish. Planning on cooking a lot of chicken or larger cuts of meat? Go for a semi-stiff blade that offers increased stability whilst maintaining maneuverability. You want to be comfortable whilst using a boning knife, as a handle that is the wrong size or shape increases the risk of ruining the meat you’re working on. Choose something with a good grip, and made from a material that offers both comfort for your hand and balance with the blade. It is important to consider the blade size and the length of the knife in total. A longer, tapered blade will make boning work easier and more precise, whereas a longer handle gives you more control. Can you use the knife that you’re looking at in a wide range of situations? The sharpness of a good boning knife means that, not only do they do their primary job well, they can also be used to slice fruit, vegetables, and function well as an all-round kitchen tool. When you’re making such an investment, you don’t want to purchase a knife that requires constant care and attention. Choose a model that has good edge retention to minimize the need to resharpen too often. However, do be prepared to wash these specialist knives by hand. Many are advertised as dishwasher safe, but it is always advisable to handwash instead in order to preserve the longevity of the knife.